Some miscellaneous stuff I've read in recent weeks. If there was ever any doubt about it, why you need to wash your sheets at least once a week. As with many alleged truisms, King's essay on writing productivity suggests that this one may not always be true. There's something to be said for taking one's time, whatever the task. But I also think that there's something to be said for keeping at one's work, taking into account the assessments of your work by people whose judgment you trust, then forging ahead. It's possible to produce both quantity and quality. Church historian and writer Martin Marty was once asked the secret of his remarkable productivity. He said the answer was simple, "Deadlines." At the height of his career as host of The Tonight Show, Johnny Carson was asked whether he ever considered doing a weekly show and if doing so would allow him to up the quality of his production. No, Carson said, quality grows to fit its space. We can all name people who have churned out garbage because they were operating on a tight timeline and trying to do too much. (We can even claim that for ourselves if we're honest.) But I buy into the idea of what Hans Selye called eustress, an optimal stress level: significant enough to challenge us, not so great as to overwhelm us. The right eustress level probably varies from person to person. That may be one reason why Joyce Carol Oates has been a prolific and, many critics believe, a good one; other writers might not be capable of such a pace. Read all of King's piece. Back when I was in elementary school, only a few kids stayed at school for lunch. The school day began at 8:30 and ended at 3:30. In the middle of it was an hour-long lunch from noon to 1, time enough for a leisurely walk from school to home and back and a good homemade lunch. The anticipation of the Jitney Lunch began when our teachers handed out 6"-x-9" envelopes that had been run through the school mimeograph machine. On the fronts of the envelopes were menu choices that we checked. Our parents tucked money for the lunch inside the envelopes and we returned them to school. The lunch was a fund-raiser for the PTA. I was reminiscing about all of this a few weeks ago with my mom and dad when a question struck me. 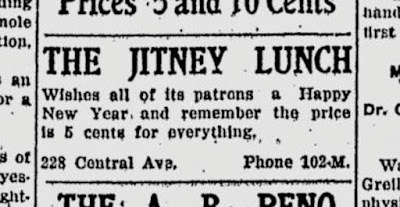 What exactly does jitney mean anyway. No one knew. All of this made sense to me. Both my grandmother and mother attended the same school when they were kids. 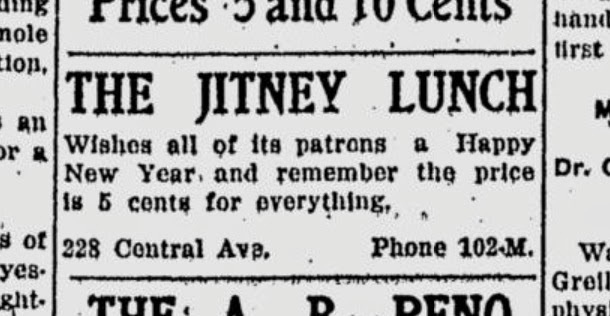 The jitney lunches were established in my mom's time and I'd remembered her telling me that the lunches cost a nickel when she was a student. ...the next step in the evolution of “jitney”—as a noun used attributively (that is, adjectivally) to mean cheap or shoddy or inferior. 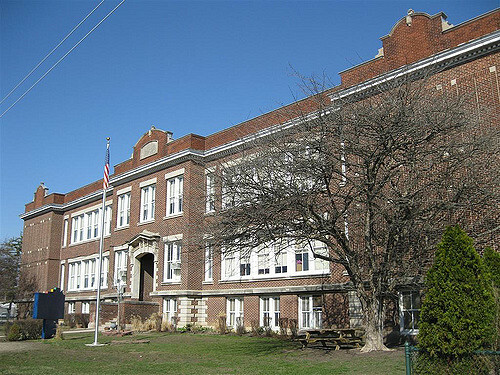 Dana was a city school. But I loved those cheap meals...and now I know why they were called Jitney Lunches. These notes encompass what I feel the Lord said to me through His Word during my quiet time with Him today. For an explanation of quiet time and how I listen to God through it, look here. I find it striking the way in which Paul and Barnabas respond to the rejection by their fellow Jews of the Gospel message in Pisidian Antioch. On a sabbath, they had gone to the synagogue there and then Paul, after he was invited to do so, addressed both their fellow Jews and Gentiles who were together worshiping the God of Israel. He shared the Gospel and there was initial interest. So much interest was shown, in fact, that the next week, they were asked to speak again. But this time, they encountered heckling from jealous synagogue leaders who turned the Jewish worshipers there against Paul, Barnabas, and their message. It’s always sad when people reject Christ and His Gospel. In doing so, they’re spurning the forgiveness, life with God, and purpose that only Christ can give. There are many different reasons people might reject Christ. For me, when I was an atheist, the biggest reason was that I couldn’t accept someone being bigger or more important than me or the human race. I also felt that our knowledge of many of the mechanics of the universe and the lack of empirical evidence for God meant that there was no God. Above all, it was my egotism that led me to my atheism. There are some people though, who reject faith in the God revealed in Jesus Christ and the truth of His death and resurrection not because of their egos, but because they don’t feel worthy of eternal life. They’ve moved from legitimate guilt, the kind of guilt that can lead to repentance and new life with God through Christ, to shame. 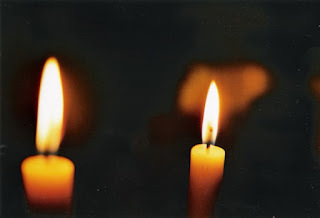 It was no doubt to this shame and the certainties of a legalistic religious system that the opposing synagogue leaders were able to appeal to among their fellow Jews in in Pisidian Antioch. In other words, they played upon shame and tradition to convince people that, even if the good news of justification by God’s grace through faith in Christ, was true, it was too good for them. They weren’t worthy of the life that was being offered to them in Jesus’ name. They were so conscious of their inadequacies that they couldn't accept the free gift of new life God offers to all who repent and believe in Jesus. The sense of shame and unworthiness from which some people suffer is the hardest, most resistant rock for the Gospel message to drill through. For Paul and Barnabas, addressing their fellow Jews in this place, the bit broke. 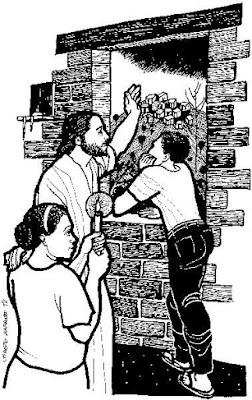 Jesus tells us: “If anyone will not welcome you or listen to your words, leave that home or town and shake the dust off your feet” (Matthew 10:14). That’s exactly what Paul and Barnabas ended up doing in this chapter (Acts 13:51). Listen: We should be lavish and inefficient in sharing the Gospel with others. This is what Jesus’ parable about the seed scattered on the different soils (Matthew 13:1-23) tells me. And we should never stop lifting people up in prayer, asking God to send workers (disciples) to them so that there can be a harvest of the seeds of the Gospel that have been planted in people's minds and wills (Matthew 9:38; 1 Corinthians 3:6). But loving witnesses for Christ sometimes reach the point at which they can’t drill past the resistance. They must pray that the witness they’ve given has not been in vain and that at some point later, the resistance will disappear and that even those who don’t count themselves as being worthy of God’s grace or salvation given in Christ, will embrace the Gospel. When the bit breaks, change things and drill somewhere else. Respond: God, help me to be lavish in spreading the Gospel with others. But help me to accept that there are some rocks of resistance on which you won’t use me to break through; that task will be someone else’s. Help me to pray for and to love those I haven’t reached and to move onto the next person with whom You call me to share Your Gospel. In Jesus’ name. This past Sunday, we began an adult class on the Lutheran catechisms. We've established a web site where we'll park audio of the classes. 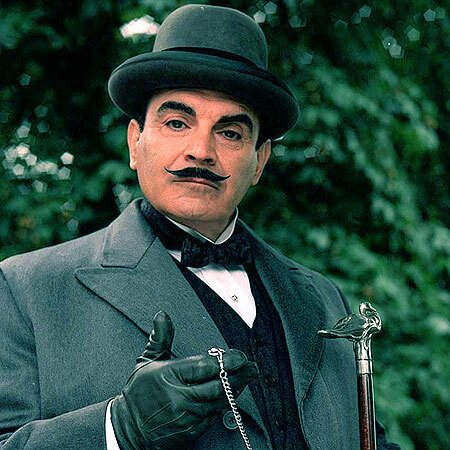 The first class audio has been posted. Here's the link to the site. And here is a link to audio of the first session. Hope that you find it helpful. At the Dayton Art Institute. This is clever. An accomplished musician offered to teach a young man how to play the piano...for free. The young man was excited to learn. For the first few sessions, the young man excitedly came to the lessons prepared and he did learn. But then, something happened. The young man still wanted to receive the free gift he was receiving and still wanted to play like his mentor. But he didn’t want to practice. He liked the idea of being able to tell people that he was a musician. But he clearly wasn’t being one or becoming one. Finally, his teacher said, “You’re not using this gift.” and he dropped the young man’s lessons. What do we do with the free gifts that come to us in this life? I’m not talking about the “free gifts” we receive from businesses trying to get us spend our money on their products. I’m talking about precious gifts given to us with love. Of all the precious gifts that might come to us in this life, none is more spectacular than God’s gift of His Son, Jesus. All who repent and believe in Jesus Christ have a great gift. It cost Jesus a death of great suffering on the cross to secure it for us. As a friend of mine once told me, "Whenever I think of what Jesus did for me on the cross, I wonder why I sin." She values this incredible gift! Our first lesson from today reminds us of how ancient Israel was given great gifts like a relationship with God, a land of their own, and the promise of life with God for all who believed. But Israel seemed to think that God’s gift was their entitlement. They turned their relationship with God into a business transaction. They thought that if they worshiped right, prayed right, sacrificed right, God would owe them what they wanted. Are we using the gift of new life God grants to all who believe in Jesus, as intended? Or are we forgetting the gift, living without the power of God in our lives, ignoring the needs of others? 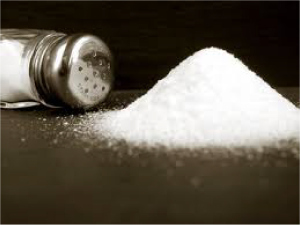 In first century Judea, salt not only seasoned food, it was also widely used as a preservative. Jesus’ disciples are people who change the flavor of this world. They’re not caught up in dog-eat-dog. They know they belong to the God Who has conquered sin, death, and darkness of this world and so, they pour themselves out in love for God, love for neighbor, and in sharing Christ with others. Jesus’ disciples also preserve the message of the Gospel for the world to know. 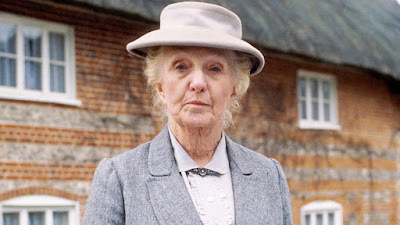 Someone has said that the Christian Church is always just one generation from extinction. Unless we pass the good news of Jesus onto our families, friends, co-workers, classmates, and disbelieving world, that good news might not be available to others. They won’t know that God can save them from sin and death. They won’t know that God can give their lives meaning and purpose. They won’t know the freedom God gives to us to fight injustice, feed the hungry, and make disciples. When salt loses its saltiness, it’s useless. When disciples no longer live out their faith, their faith is useless and they erect a wall between themselves and God. When I was in the fifth and sixth grades, it was common for boys and girls who liked each other to say that they were "going steady." Going steady then basically meant that they held hands when they walked home from school and when their parents dropped them off at places like the movies or Fun Night. In the sixth grade, I couldn't figure out why any girl wouldn't go steady with me, because I was a charmer. Eventually, I asked a girl to go steady with me. She said yes. Then, I thought better of it. The girl wasn’t popular and I was afraid that people would make fun of me if they knew that I was seeing her. So I asked her if we could keep the whole thing our little secret. Not good. Here’s the deal: When Jesus Christ is your God and Savior and King, you don’t ask Him to let you keep the whole thing your little secret. When we push Jesus into the closet of our lives, we can’t fulfill our purpose in life of bringing His light to others. We also plunge our own lives into darkness, snuffing out the flame of Christ’s grace that comes to those who believe. Do you own your relationship with Jesus before the world? Do people know that the good you do in your daily life comes from Jesus Christ alone? You and I were saved from sin and death so we could be free to live in the brightness of God’s grace, with Christ’s love at the center of everything. It's not a thing to be concealed, but shared! In Matthew 5:17-20, the balance of our Gospel lesson, Jesus warns us not to forget God’s moral law. The moral law is summarized in the ten commandments. Jesus further distilled them in the great commandment: Love the Lord your God with all your heart, mind, and strength sums of the first through third commandments; love your neighbor as you love yourself summarizes commandments four through ten. Some people see God’s forgiving grace as license to do whatever they want to do, to ignore God’s will for human beings as embodied in God’s moral law. Wrong! God’s grace isn’t permission to ignore the will of God. God’s grace is the freedom to daily call out to God for help in the name of Jesus to seek to live a life lived in the power of God. Christians see grace as their emancipation proclamation; in Christ, God sets us free to pursue being our best selves, our God selves. That’s what Christians seek to be with the gifts of grace--forgiveness, new and everlasting life with God--that come to us through faith in Jesus. The Pharisees of first century Judea, of course, were known as a straight-laced, judgmental bunch. The Pharisees boiled down their faith to a contract with God: If I do good things, God is bound to recognize my righteousness. But the Bible testifies that none of us has or can attain righteousness on the strength of our own good works. You know, there are times when I do something good, that follows God's will, and I think to myself, ever so subtly, "I really am a good person." Even the good things I do in response to God's grace then, aren't free of the taint of my sin. But thank God, God seeks us! He wants us with Him for eternity. And to everyone who daily surrenders to God’s grace, available in Christ, God gives what we can’t earn, manufacture, or pretend our way into having. God gives us His righteousness, a right relationship with Him, with others, with ourselves. God covers us in the pure, perfect righteousness of Jesus that infinitely surpasses any righteousness that can be found or faked in this world. The righteousness of Jesus given to those who believe is the greatest gift of all. Then let Him use you to be salt and light, upholders of His law, bearers of His righteousness. *It's important to remember that repentance isn't simply sorrow for one's sin. It's a sorrow that leads one to turn to Christ for forgiveness, for the granting of grace that covers our sins, and for the power of the Holy Spirit to lead new lives filled with peace with God.